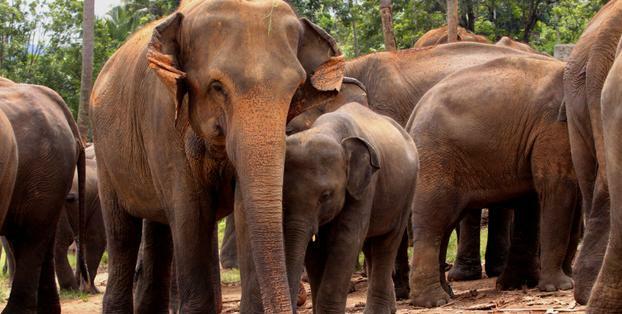 The North Western Province supports nearly 20% of the estimated elephant population of Sri Lanka. This elephant population is scattered in small pockets of habitats as small herds and individuals. Large areas of land have been cleared and extensively planted with crops that are palatable to elephants such as banana and rice. This project will seek strategies for reopening elephant corridors in the northwestern wildlife region, identify the locations of existing elephant corridors and isolated elephant habitats, and identify suitable areas for development that will not block the natural migration routes and does not harm the natural food sources of the elephants. and find the possibility’s to reopen and attended immediately, in order to take action over other relevant causes as well. in this region (DWC 2012). elephants. The next concern was promoting cultivation of crops, changing the possibility of the periods and make. Elephants within the protected area network can be protected, but acknowledges that ensuring longterm survival of elephant population outside the protected area network, though difficult, is critical for their long term survival. While the policy makers are looking at the broader picture and how to make policies that will mitigate this problem, other groups of people and government departments are responsible for wildlife and are trying to solve the problem on the spot, where it actually happens, with the effort of the locals. 1. Objective: To identify the areas with escalating human elephant conflict in the Kurunagala and Puttlam Districts. being collected, and socio-economic surveys being conducted. Accomplishment of this objective is being evaluated by data from DWC, and discussions forums with the villagers, and field observations. Accomplishment of this objective is being evaluated by discussion forums with stakeholders in the Districts and with DWC. 4. Objective: To document how local organizations/communities cope with the problem. Accomplishments of this objective is being evaluated by discussion forums with stakeholders in the Districts and by socio-economic surveys. To identify communities that are highly effected by human elephant conflict, their social interactions with other human beings, and the challenges presented by their livelihoods. Conducted 2 discussion forums with villagers on how the villagers gather information and benefit from different knowledge systems available to them. 3. Organized and conducted knowledge sharing workshop. Conducted 2 discussion forums with stakeholders (1 in Kunagala District and 1 Puttlam District) to develop practical and enhancing methods to deal with this problem. Conducted 1 discussion forum with Department Wildlife Conservation. Two assistants were in the village for 3‐5 days to review the project activities and to assess the success of the research methods used. GPS data was reviewed every month by the project coordinator (6 reviews). During the survey for this project, we were able to discover illegal elephant trafficking activity that might not otherwise been known to officials or the general public. We have pursued legal action, conducted press conferences, and led awareness campaigns to try to stop the abuse of elephants that are being kept in captivity illegally and to stop the trafficking. Activities completed are shown in grey below. The project is at 6 months in the timeline. The socio-economic survey and discussion forums are slightly behind schedule, but we expect to complete these activities as needed with no negative impact to the project overall. One reason for the delay with these activities is the issue of wildlife trafficking. obtained from the project for the use of policy makers to formulate a sustainable long term land use practice to reduce the conflict between man and elephants with all relevant maps of isolated forest areas, jungle corridors and suitable areas for the electric fences. 12 isolated habitats are identified and mapped, some of the forest areas under forest department and some under wildlife department , conducting meeting to finalize to identify the relevant authority. 8 existing electric fences mapped including Kalawewa and Kahalla pallakele electric fences.